At iHealthSpot, healthcare marketing isn’t what we do – it’s all we do. Since 2007, we’ve been helping doctors, hospitals, and medical practices gain new patients through the use of cutting-edge and innovative digital marketing campaigns. Our team of strategists, writers, developers, social media managers, SEO Specialists, and reputation managers have helped hundreds of doctors build and maintain an active online presence that engages with online visitors and converts them into new patients. Your website is the center of your digital marketing strategy. When it comes to attracting new patients, you need a website that makes it easy for patients to discover who you are as a practice. 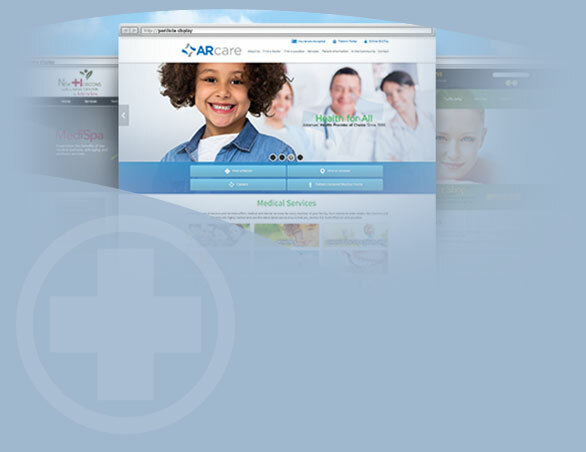 At iHealthSpot, we work with each of our client’s individual practices to create a website that is unique to them. As the online world has changed, so have our websites. Employing Mobile responsive design, HIPAA Compliant appointment request forms, ADA Compliant design, Online Bill-Pays, and Secure SSL Certificates, we can help you build a website that will truly set you apart from the competition. Our Enhanced Search Engine Optimization programs work to increase your practice’s visibility on Google and other popular search engines. Through our discovery process, our SEO Specialists learn about your practice and optimize your website for the conditions and treatments you choose. Our strategy helps build online credibility for your practice while also building a relationship with potential new patients. Pay-per-Click advertising allows you to magnify your online presence and only pay for results! Our strategist do a comprehensive keyword analysis so that you only pay for the keywords that place your practice in front of the people who are most likely to walk in through your doors. Using aggressive targeting, we can choose to only display your ads within a certain area and only to a specific demographic. Our goal is to maximize your return on investment every single month. With over 1 Billion active users on Facebook alone, social media networks have become one of the largest growing and most effective digital marketing strategies today. Patients use social media to engage with new practices, leave review, read comments, and even share their own experiences with their friends. By harnessing the power of social media networks, your practice can start building a powerful community of engaged patients while also acquiring new patients. Statistics show that over 60% of patients today read online reviews before visiting a new practice. Our reputation management services allow medical providers to lead the conversation online, ensuring that they get real-time notifications of any reviews that filter in from hundreds of different online review sites. Our reputation managers work to answer all new reviews while working alongside the practice to increase the amount of positive reviews made online. With hundreds of different online directories out there, for a practice, it may be hard to keep up. Our local listings management services makes certain that all online listings like Google Maps, Yelp, and Apple Maps have accurate information about the practice (e.g. hours, phone number, address). We work to keep these listings updated with holiday hours, new providers, and any other practice changes. Our priority is to guarantee that when a patient finds you online, they can actually find you.